Time to Play: 40 Min. Who is the best angler? 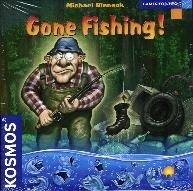 One player takes the role of the two anglers and tries to catch as many fish as possible. The other player takes the role of the fish and with bluff and skill tries to hinder the anglers from catching fish. The angler player decides where to fish, but must do so in the dark (that is, he cannot really see where the fish are), as the fish cards are placed face down. Because of this, he does not know whether he is catching a fish or garbage. Also, when he is lucky enough to catch a fish, he will not know until he lands it how valuable it is. With clever movement of his fish, the fish player tries to get garbage and small fish onto the anglers hooks. After one game, the players switch roles. After two games, the player with the most points is the winner.